TOYAH: I'll get a map next time! KEITH BUTLER: Did you get very lost? 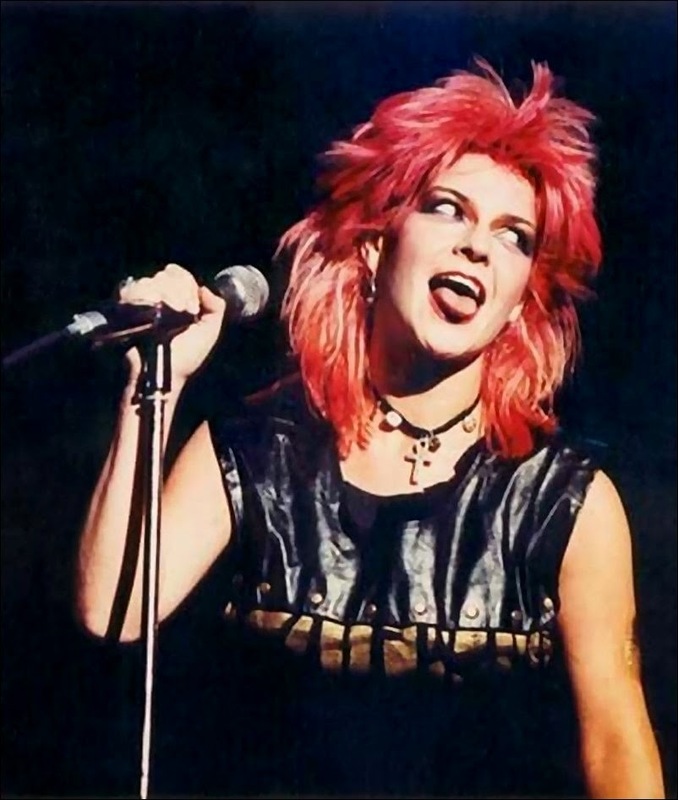 TOYAH: We sort of got lost in Reading and when we stopped to ask the way they asked for my autograph and I was trying to explain that we were in a hurry. Then I heard the trailer on the radio and thought oh no we're got going to make it, panic! KEITH: Well done, great first appearance, thanks a lot for coming in once again to see us. KEITH: And happy birthday for four days as well. KEITH: There were a lot of people there. KEITH: You've got some cards sent in as well. TOYAH: It's my big mouth isn't it? KEITH: That's the latest single from Toyah but actually while that single was playing your record company called us to discuss one or two things concerning the design. 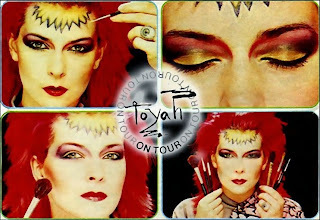 TOYAH: They won't leave me alone. KEITH: The design for the new album cover (was a) - “yes”? “The Changeling” - it's very closely linked to the image on the single cover. 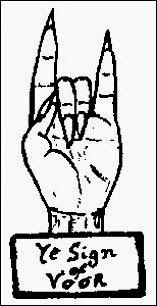 Tell me if I'm confusing you – on the album cover I'm sitting on a middle of a rock, which is how the video for the single starts and I've got these little horns like fangs … I'm showing you with my finger and no one can see! KEITH: I can see, it's OK! TOYAH: Anyway I'm sitting there looking very sort 0f miserable and I'm fed up being on this rock and you turn the album over and there's the “Brave New World” image. The reason I'm urgently talking to the record company is because it's got to go to the printers tomorrow so I've got to get back to London and put everything right. KEITH: So you've got final discussions this evening? KEITH: Have you actually designed all the album covers as well? TOYAH: Yes, well, I don't actually sit down at the drawing board and come up with an idea and get the people together and I say "look I really like this and I'd like this location and I want this sort of mood". I mean I leave things very open and free. Because I feel if I got an art director in and said do this and do that you're crushing his creativity and I don't like people doing that to me so I'm not going to do it anyone else. KEITH: So you take a great interest in the designing? TOYAH: Oh yes! Because it explains the music, it explains the sort of diversity in my lyrics if anything and it's a part of me. I don't like album covers that aren't interesting to look at while you're listening to the music and that's the reason why I do it. KEITH: It's a marvelous art from and yours of course are so colourful and so beautiful. Is it because over the years lots of artists are not really projecting the right sort of image with the album covers for the project inside? TOYAH: Well, it's not only that - getting back to influences, David Bowie used to produce such incredible covers – they were so inspiring and you felt you knew him when you looked at them. You felt wow, I know what he's about and because of those strong connections with Bowie and people like Marc Bolan as well I want to create the same atmosphere. KEITH: So you obviously feel getting to know the artist is so important as well? TOYAH: Yes, as well as getting to know your audience and of course the audience they write straight to me and say what they think. KEITH: Does that get on top of you sometimes these people getting at you? TOYAH: No, the only thing that gets on top of me is I can't read the writing sometimes. These people write about 20 pages and you can't read the writing. That's sad because they've taken so much time to write you a letter. TOYAH: Right. The reason we do that is when I'm on tour with the band playing live concerts I like to spend about six hours before the show setting up the stage props and everything and when you're asked to do interviews I have to turn them down and it's sad … It's not because I don't want to do them, it's because I just haven't got the time. So that's why I'm doing this promotion tour so that no one will be upset when I'm doing an actual tour and I won't have ignored anybody. KEITH: When's the concert tour coming up? TOYAH: It starts on June 28th and it's only for a month but we're doing two nights in each major city which is something we have never done before. We're doing 4 nights at Hammersmith and like an idiot I left the dates somewhere – I can't remember them but I'm sure people can find them out. We're really looking forward to it. KEITH: Toyah and one of my favourite singles from last year. She's with me this afternoon if you want to call then you're more than welcome. Reading 25622 to put a question or two or three or four to Toyah. Phone in to have a natter with Toyah. On the telephone is Kim - you've got a question for Toyah, haven't you? KIM: How do you get your eyes black? KEITH: Thanks to Kim. Here is Karen, what's your question for Toyah? KAREN: How long does it take you to put on your make-up? TOYAH: Ah, good question. Well, let's say it's for a studio session and for singles and record covers. We usually take all day - I mean that's sounds really boring and it's not because they have to mix the cement up to cover my face – it's because we are perfectionists and we like spend a nice relaxed day at it and actually the make-up takes longer than the actual photo session. But when I'm on stage with the band I usually take about two hours. I spend 20 minutes doing my make-up and the other hour and a half I lock myself away in a room to sort of get over my nerves as it were. So it's really quite a long day when we start working on the make-up. The daytime I'm bored with wearing make-up, I don't wear it. I think "oh no I can't be bothered to put it on" but I have to wear some because I'm not young like you anymore. KEITH: Thanks Karen, that's question a was going to ask in a couple of minutes. Here's Jenny, hello Jenny and here's Toyah. JENNY: "The Blue Meaning” LP cover, what inspired it? Well, it's a rebellion thing really, it's sort of … I know it sounds horrible but it's a bit of feminism really. It's sort of the woman being rebellious so the men tied her up because she didn't want to serve the tea because there's also at my feet a tray with spilt cups and everything. The idea is the maid refused to make tea and do the washing up and do the laundry basically. KEITH: OK, that's Jenny on Reading 25622. Next on the phone is Helen, hello? HELEN: I heard on a programme that you weren't going to wear make-up anymore? TOYAH: No, I mean I wasn't – was that on Razzamatazz by the way? TOYAH: No, I mean people have got it wrong. What I meant was you always wear plain make-up on your face, do you know what I mean - day make-up? What I meant was I didn't want to paint tattoos over my face, I wanted to move them down into more experimental parts of the body like your shoulders and your knee caps where people don't think of wearing make-up. KEITH: That's Helen. Here's our next customer Gail, hello Gail. GAIL: What's been your worst experience on stage? TOYAH: Oh my goodness, there's been a 101. I think in my early days when I suffered really badly from nerves. I would honestly just crack up and loose my voice and not just be able to go on and just say "I've got to get off" and it took a long time to get over those nerves, they were really over the top and that was a bad experience for me. There's been other things – when I was doing a play called “Sugar And Spice” which was a acting role. There were things like the lights didn't go up when you're about to start acting and the whole audience starts laughing and you don't know what to do, you're just stuck there in the middle of this auditorium wondering what on earth you're going to do about it and the audience stars cheering and clapping and things like that … But at the same time those are all experiences you can look back and laugh at really. GAIL: Which one do you dread most of all? TOYAH: Nerves, it's always nerves because nerves … you must suffer from nerves when you do exams and things like that, they make you feel – they make you forget the words to your songs and you forget what town you're in and that's how my nerves affect me. I start forgetting things, I start forgetting my name and it's really embarrassing because you just look like an imbecile and it happens to be in front 3000 people, you can't really turn round and go "oh excuse me but I'm really nervous" because people don't expect you yo be like that. KEITH: Thank you to Gail, next is Sarah, hello! SARA: Where do you get your ideas for your make-up and costumes? 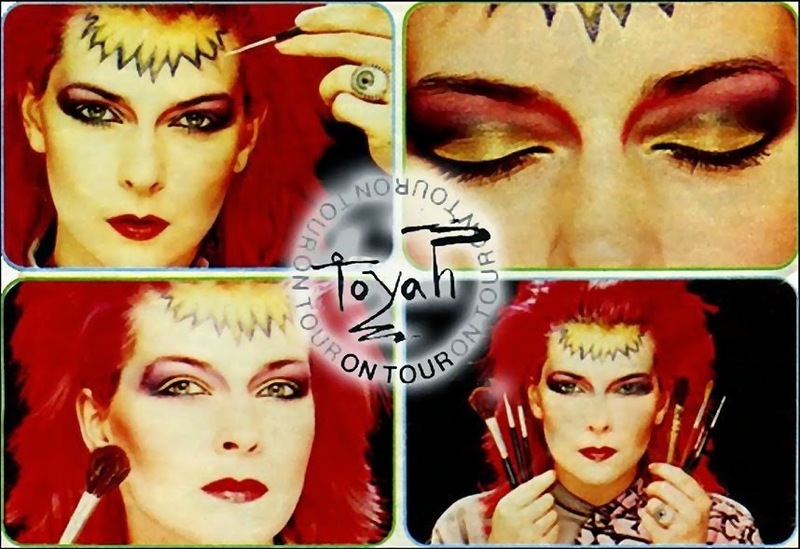 TOYAH: Well, as you probably know I started off very early, sort of about 12 (years) wearing make-up and experimenting but it wasn't until I did a song called “Thunder In The Mountains” that I bothered to formulate these ideas. I began to think it would be really nice to do a new image for each single to explain the song. I've got lots of ideas from movies, especially science fiction. They really give me a lot of encouragement but I'm not that great that I can actually sit down and do it all myself. So what I do I go to a lot of fashion people and I say "could you tell me the hottest new make-up artist around" and then I find out who that is and have a meeting with her and we trigger off ideas with each other. It's a bit like at school when you're in your art lesson, your art teacher sort of triggers off ideas with you and that's how I do it. Sometimes I get books on artists like Picasso. On the new album cover “The Changeling” I've got a sort of Picasso painting all down my back and it's nice to take -say your mum's got a lovely vase, you take the design off that and put it on your face and it's a very abstract thing to do but a it's a great way of getting ideas so you can go off and look your mums vases or something. Or look at a Heinz baked bean can – oh gosh, I am on a commercial station … You know things like that, just taking domestic things and turning them into art work. Go Andy Warhol really. KEITH: Thank you Sarah, here is Jane. JANE: Can I ask what does the sign Voor really mean? KEITH: Thank you Jane, next on the line we have Matthew. TOYAH: I think about the band. MATTHEW: Does that worry you? TOYAH: No, I think about the group the whole time but you can't stop people's opinions, that's why we're a free country really. But it's always a problem, like Blondie slowly became Debbie Harry. I don't think it's worth getting paranoid about, the group understand it and they tolerate it very well indeed. I always think we're a group because I certainly wouldn't go on stage without members of my band, they are equally important and we all write together and our real dedicated fans know that we're a group. But there really is very little you can do about it because we send out things – they're called press handouts and we are called a group so people do know that but you do always get some member that people focus on – who the media focus on and there is very little you can do about it. KEITH: Lovely - but of course you've got your tour starting soon, on the 18th of June. KEITH: And you're in Hammersmith? they are the nearest two to Reading. KEITH: And the LP next month? KEITH: Back on the phones and first on is Paul. PAUL: You're a very busy lady on these tours, how do you do it? Do you keep fit or something? KEITH: Oh, that's so typical of Maureen if you ask me! TOYAH: Oh, here she is! SUSAN: Me and my mum are great fans and we'd like to know what you think of violence? TOYAH: Violence is very very sad, it's very over rated really. I mean I should know I've been enough scuffles in my life and I'm not proud of them. I think it's something kids go through. In school days you always start fighting but it'd be great if we had a world without violence but it seems an impossibility, we're such an aggressive race. It's an instinct really but I don't agree with it myself. I certainly don't agree with mugging, I actually hate watching wrestling because that to me - it's horrible, I can't stand it … Fighting the whole time, it's very depressing but it's something that one day we may have a world without it and it would be very wonderful. KEITH: Susan, thank you very much for your call. Thank you to Toyah very much for coming in! TOYAH: OK, I'd love to. Simon & Denise, Issue 1, June 1982. Read the Smash Hits interview by Dave Rimmer (below with Toyah on the grounds of the radio station) from the same day (from the fabulous Like Punk Never Happened archive by Brian McCloskey) here and here. You can download the pages by clicking on the downward arrow at the right bottom corner.